With a stay at Meridian Plaza by Beach Vacations , you'll be centrally located in Myrtle Beach, within a 5-minute drive of SkyWheel Myrtle Beach and Ripley's Aquarium. This beach hotel is 0.7 mi (1.2 km) from Myrtle Beach Boardwalk and 2.1 mi (3.3 km) from Broadway at the Beach. Make yourself at home in one of the 94 air-conditioned rooms featuring kitchens with refrigerators and ovens. Your bed comes with premium bedding, and all rooms are furnished with sofa beds. Rooms have private balconies. Complimentary wireless Internet access keeps you connected, and cable programming is available for your entertainment. Take advantage of recreation opportunities including an outdoor pool and an indoor pool. Additional features at this hotel include complimentary wireless Internet access, wedding services, and tour/ticket assistance. 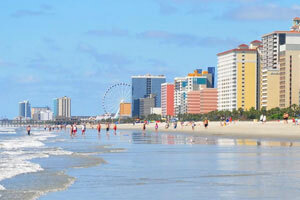 The preferred airport for Meridian Plaza by Beach Vacations is Myrtle Beach, SC (MYR).